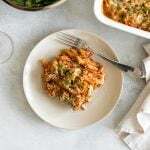 This baked chicken parmesan casserole for two is a low-prep dinner that takes all of ten minutes to get in the oven. 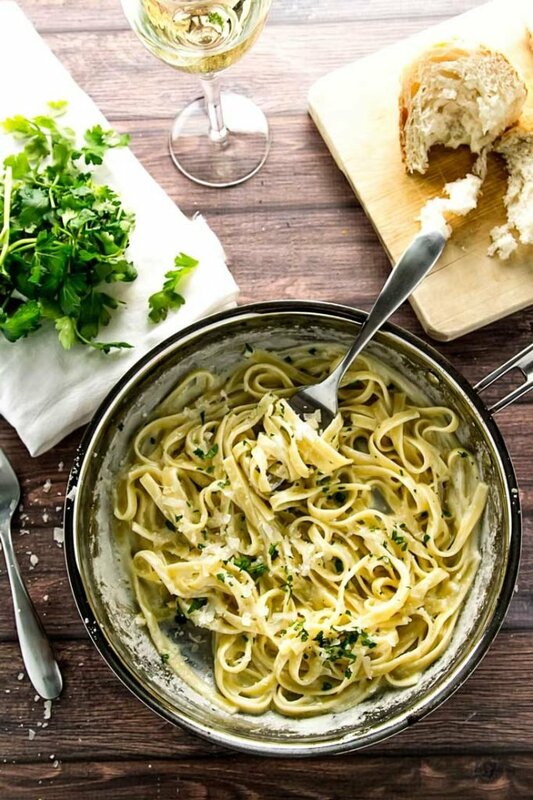 All of it – including the pasta and chicken – cook together in one baking dish so there’s no need to use different pots and pans to boil the pasta and bread and fry the chicken. It has everything you love about a classic chicken parm – including a crispy breadcrumb and cheese topping – without all the extra work. Circa 2010ish I found a recipe for a chicken Parmesan dish on Food Wishes that borrowed all of the best features of a classic chicken parm – crispy breading, tender chicken, and bubbling sauce – but served up casserole-style thus eliminating the labor-intensive step of breading and frying the chicken in a pan. The site became a favorite of mine, but I never made the chicken parmesan because, while I loved the concept, I didn’t have a need to feed an army and so I was never in the mood to make a giant casserole that calls for six (!) chicken breasts. But due to my food-obsessed nature, I’ve thought about it often over the years. So after almost 9 years, I finally tackled a scaled-down baked chicken parmesan casserole inspired by the one I found all those years ago. 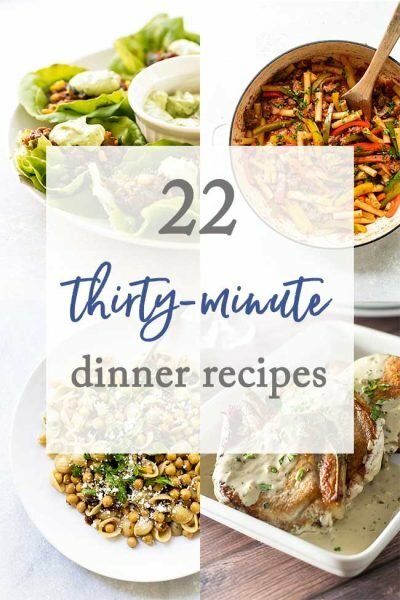 I borrowed the basic concept but I put my own spin on things and, after several rounds of testing, landed on a version that is light on the prep work but delivers big in the cozy comforting dinner department. All of it, including the pasta and chicken, cook together in the oven – no need to drag out extra pots and pans for this one. All you need is a baking dish. It starts with store-bought marinara sauce. I like to use one that is low in sugar and free of weird ingredients like Bertolli or Rao’s Homemade. Add a 1/2 cup of water to the sauce to thin it out. Because the pasta cooks directly in the sauce you need a little extra liquid to ensure it cooks properly. Pour the sauce into a small (7-inch square) baking dish. Add the uncooked penne and stir it into the sauce. The pasta should be totally submerged in the sauce. Cut an 8-oz boneless, skinless chicken breast into bite-sized pieces, season them with salt, and place the pieces in the dish with the pasta and sauce. Nestle the chicken into the sauce with the pasta, but make sure the pasta is still covered. It’s not so important that the chicken be totally covered by sauce. For the breadcrumbs, I used day old bread and cut it into small cubes. You can use any kind of bread you want – I’ve used everything from leftover slider rolls to sandwich bread. I don’t recommend using dried breadcrumbs that come in the canisters. They are too fine and you won’t get that toasty breadcrumb texture in the final dish. I like to season the breadcrumbs with salt, pepper, and dried Italian seasoning before spreading them in an even layer over the top of the chicken, pasta and sauce. 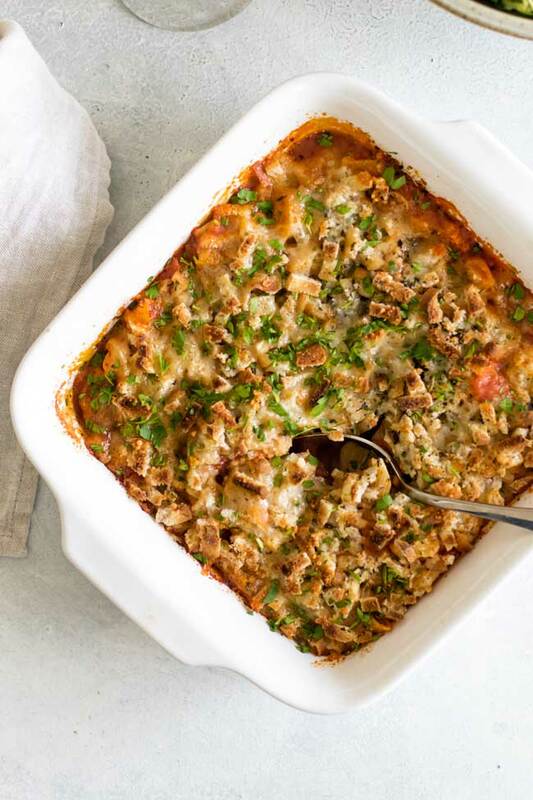 Sprinkle some grated Parmesan cheese over the top of the breadcrumbs, cover the baking dish with foil and bake the casserole for about 40 minutes. I like to broil the top of the casserole at the end of the bake time to get the breadcrumbs all toasty before serving. Serve it with a simple green salad, glasses of wine and enjoy! 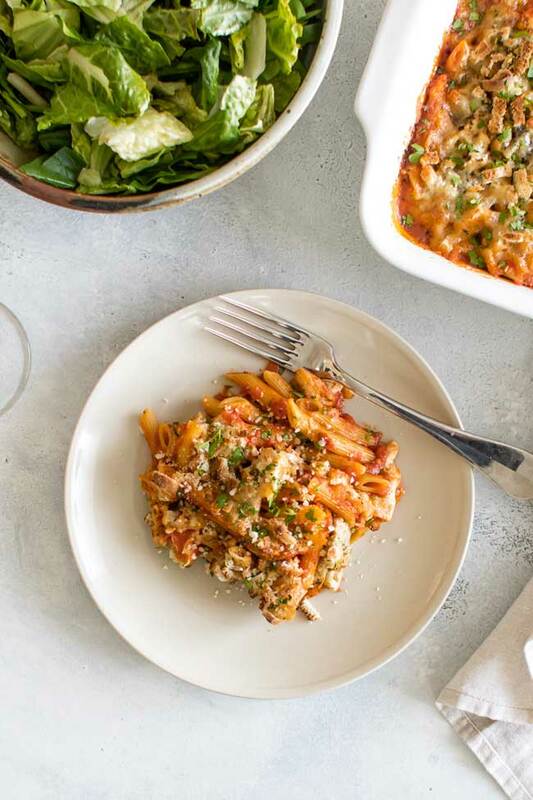 This chicken parmesan casserole for two is a low-prep dinner that takes all of ten minutes to get in the oven. 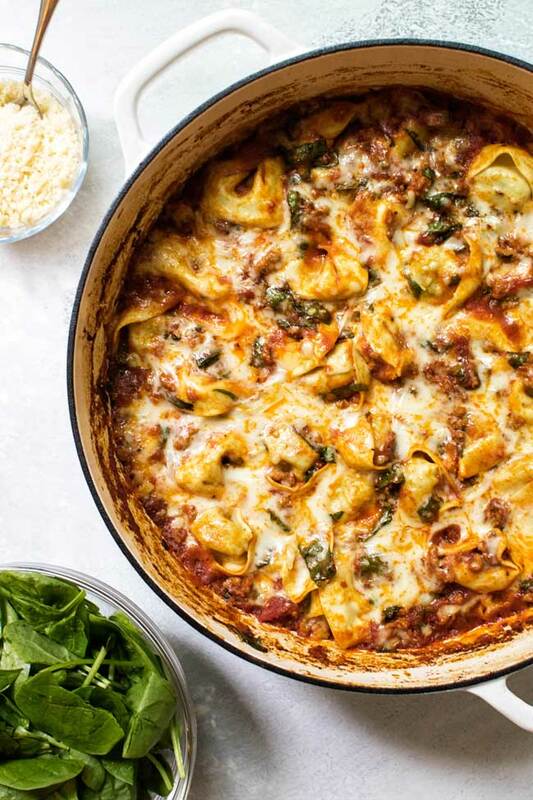 All of it – including the pasta and chicken – cook together in one baking dish so there’s no need to use different pots and pans to boil the pasta and bread and fry the chicken. It has everything you love about a classic chicken parm – including a crispy breadcrumb and cheese topping – without all the extra work. Preheat the oven to 375°F. Pour the marinara into a 7-inch square baking dish (see note). Add the water and stir to combine it with the sauce. Add the uncooked pasta and stir it into the sauce so it’s completely submerged. Nestle the chicken into the pasta and sauce ensuring that the pasta stays submerged. It’s okay if some of the chicken is not totally covered with sauce. In a small bowl, toss the bread crumbs with the salt, pepper, and Italian seasoning. Sprinkle the breadcrumbs in an even layer over the top of the pasta and chicken. Sprinkle the grated cheese over the top of the breadcrumbs. Cover the baking dish with foil and bake the casserole for 35 to 40 minutes. Uncover the baking dish, turn the broiler on, and place the dish below it. Turn the oven to broil and broil the top of the casserole for a few minutes or until the breadcrumbs are golden and toasty. Let the casserole stand for a few minutes before garnishing with the parsley (if using) and serving. I don’t recommend using store-bought dried breadcrumbs (the ones sold in the canister). The texture is not right for this recipe. Instead, use day-old bread and just cut it up into tiny cubes. It can be any kind of bread or rolls – sandwich bread, leftover slider rolls or hamburger buns, and hot dog buns all work really well. I’ve only tested this recipe with white bread, but I imagine whole wheat bread would work well, too. I used a 7-inch square baking dish, but I’ve also tested this recipe in a 9×5-inch rectangular casserole dish. 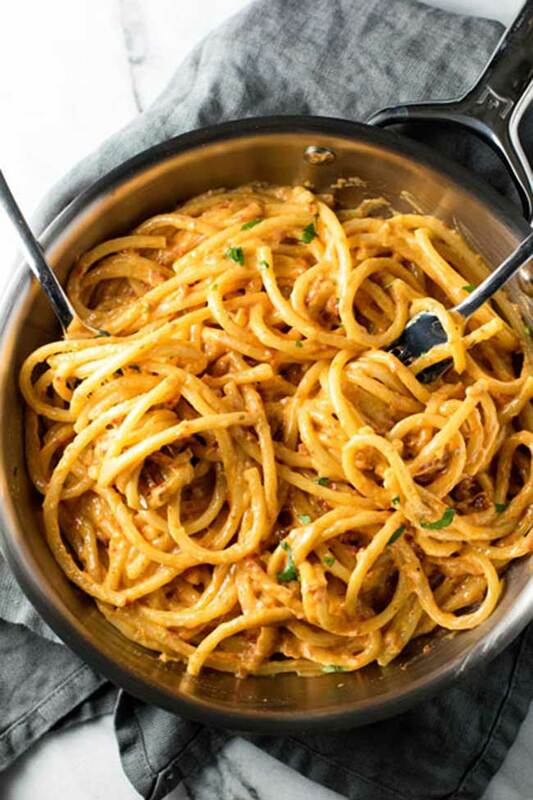 You want to use a dish small enough so the pasta is completely submerged in the sauce, so keep that in mind. Most of us have an 8×8 cake pan hiding in the recesses of our dark cabinets so if you use that size you may want to add just a tad more sauce to ensure the pasta is covered.